Three known species, the following and one in Japan. Type species: Triantha glutinosa (Michx.) Baker. Capsule oblong, 3"-3 1/2" long; perianth-segments thin. Capsule ovoid. 1 1/2"-2" long; fruiting perianth-segments rigid. 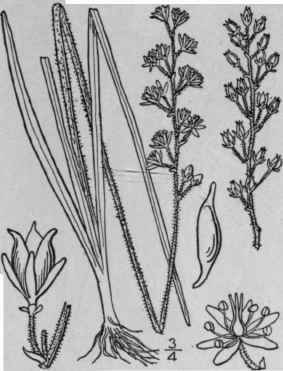 Narthecium glutinosum Michx. Fl. Bor. Am. 1: 210. 1803. Tofieldia glutinosa Pers. Syn. 1: 399. 1805. Triantha glutinosa Baker, Journ. Linn. Soc. 17: 490. Stem viscid-pubescent with black glands, 6'-2o' tall, bearing 2-4 leaves near the base. Basal leaves tufted, 2'-7" long, 1" - 3" wide; raceme oblong and 1/2'- 1 1/2' long in flower, longer in fruit, the upper flowers first expanding; pedicels commonly clustered in 3's (1's-4's), ascending, viscid-pubescent, becoming 2"-6" long in fruit; involucral bracts minute, united nearly or quite to their apices, borne just beneath the flowers; flowers 3"-4" broad; perianth-segments oblong, mostly obtuse, membranous; capsule oblong, about 3" high, 1 1/2' in diameter, thin-walled, twice as long as the perianth, the beaks 1/2' long or less; seeds slender-tailed at each end. In bogs, Newfoundland to Minnesota, Maine, Ohio, Michigan, and in the southern Alleghanies. May-June. False asphodel. Melanthium racemosum Walt. Fl. Car. 126. 1788. Nartlicciitm pubens Michx. Fl. Bor. Am. 1: 209. 1803. Tofieldia racemosa B.S.P. Prel. Cat. N. Y. 55. 1888. Triantha racemosa Small, Fl. SE. U. S. 249. 1903. Similar to the preceding species but rather stouter and taller, stem 1°-3° high, the glutinous pubescence rougher. Leaves very narrowly linear, 6'-18' long, 1 1/2" - 3" wide; raceme i'-4' long in flower, often loose, somewhat longer in fruit, the uppermost flowers first expanding; pedicels mostly clustered in 3's, ascending, a"-3' long in fruit; involucral bractlets about i" long, united to above the middle, borne just beneath the flower; perianth-segments narrowly obovate, obtuse, rigid; capsule ovoid, 1 1/2" long, little longer than the calyx, its beaks 1/2" long; seeds short-tailed at each end. In swamps, southern New Jersey to Florida and Alabama. 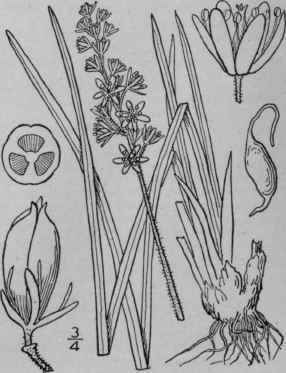 This and the preceding species are also known as False asphodel. June-Sept.